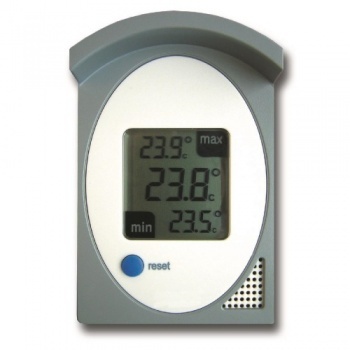 Digital outdoor max min thermometer in a grey and white case with large splashproof displays for outdoor or indoor use. Simple to use, useful to have but a poor design for positioning. The hole at the back is too small for any hook, screw or nail and so badly placed it is impossible to thread a cord or wire. The pull-out stand is badly angled and the screen rather dim.